The East County Hot Shots were recognized by the local paper for their excellent season topped off with a generous contribution to local charities. The 12U Fall team had a great year, placing second in three of their six tournaments. They ended the season by spending a rainy Saturday afternoon collecting canned foods and other groceries from family, friends, and nieighbors. 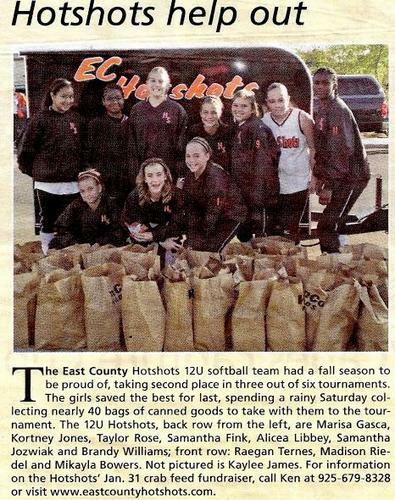 The Hot Shots collected nearly 40 bags of food to donate during their final tournament of the season.